Some of the most convenient computer enclosures I've used for LAN parties and shows in the past have had an integrated handle on top. While handles make it very simple to transport a system, they were still very much your typical vertical tower style enclosures. Some were mid-tower and others were nearly full tower meaning you're still hauling around a large system. Cooler Master, a big promoter of some very unique modder friendly enclosures, decided to get horizontal. In other words, they designed an attractive horizontal enclosure but gave it the heart of an open air test bench. The Cooler Master HAF XB offers an open air design inside, but integrates the right amount of features including handles on each side, just in case you decide to go mobile when you take it to a place like a LAN party. Recently, I hit the InfernaLAN LANfest and with the help of GIGABYTE, I put together a very cool system to show offer featuring this chassis. Let's see how it did in the field! 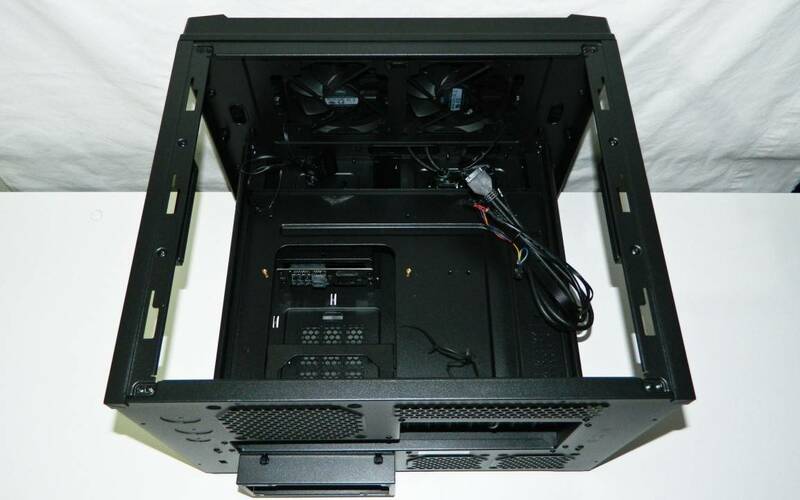 Since the Cooler Master HAF XB is a horizontal computer enclosure, this means the motherboard and connected system all mount horizontally instead of vertically as they would in a tower. There's even room for liquid cooling systems that mount in a traditional tower. 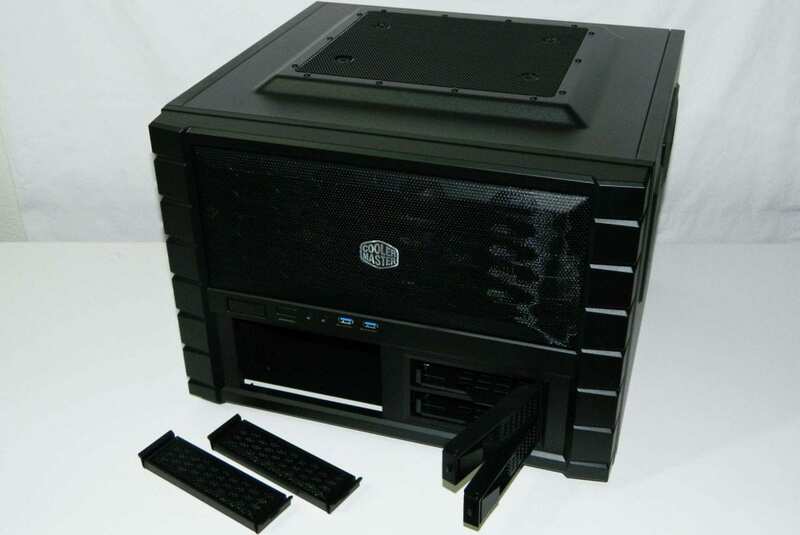 The big features are the removable motherboard tray with CPU cooler cut out, hot-swap removable 3.5" hard drive trays, filtered front ventilation, and deep formed handles for easy lifting when taking the system on the go. While theses handles are about 1.5" deep, it would help a lot of they tilted upwards as well, providing some additional grip. In terms of the engineering and uber-geek specifications, the HAF XB is designed to support very large CPU coolers and video cards. 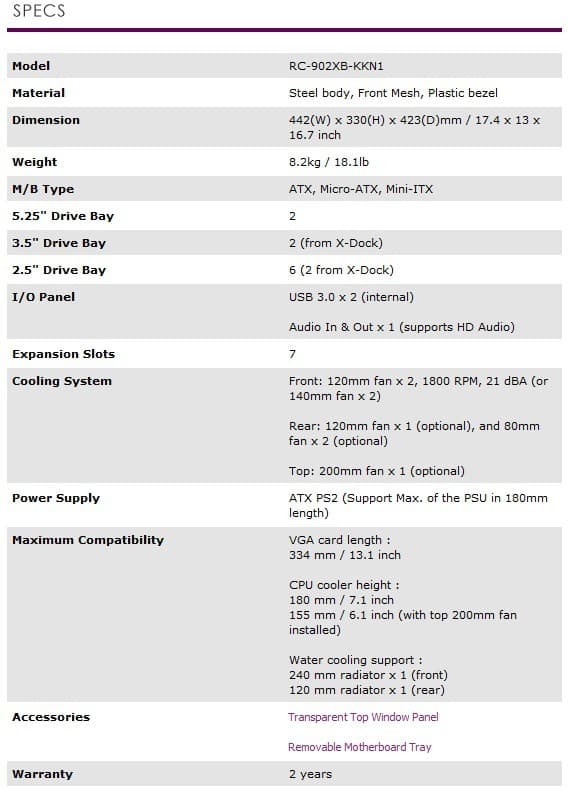 Additional specifications are below. Other things to note are that the enclosure comes with two front 120mm 1800rpm intake fans and one rear 120mm exhaust fan. These are unfortunately only 3-pin fans so they aren't PWM controllable. Manual control via the motherboard or fan controller are two other options for tuning. As far as different trim or customizations go, the HAF XB comes with a mesh top lid but users can purchase an optional top with an acrylic window instead for about $15 USD from the Coolermaster online parts store. Unfortunately, the case only comes in black which means that you'll have to paint it if you want anything other than that. 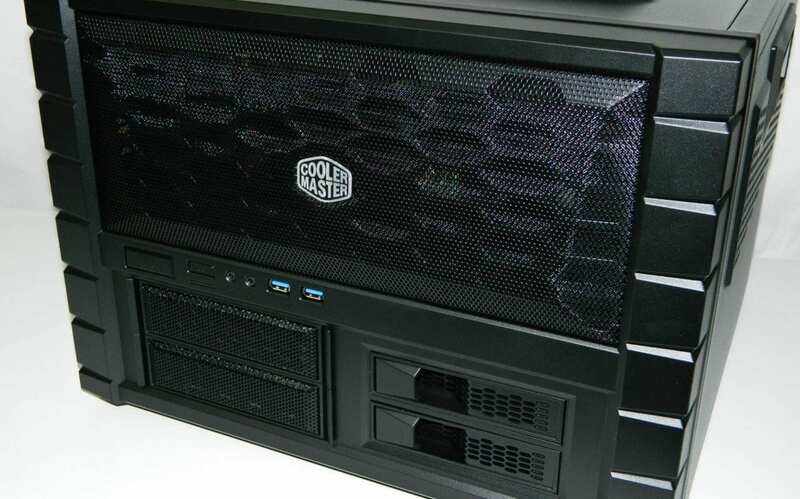 The total price of the Cooler Master HAF XB from $94.07 - $130.94 from various retailers. Although not a bad price at all for such a unique chassis, its primary competition has to be the equally LAN party friendly BitFenix Prodigy which comes in at as low as $79.99 and comes in both a range of colors. 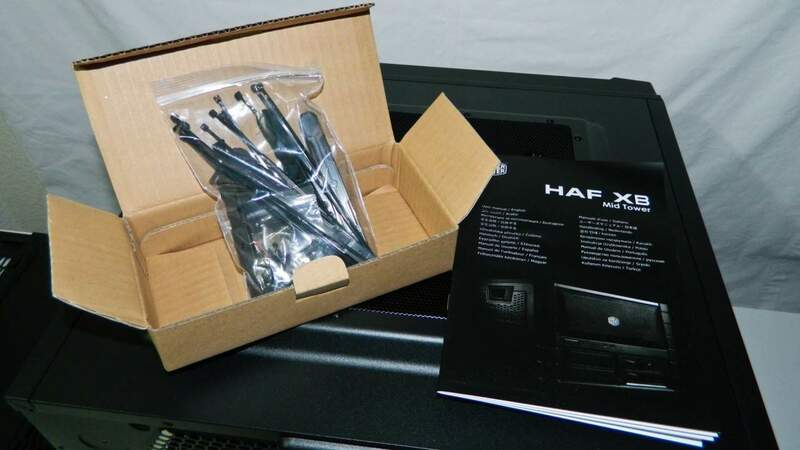 But the HAF XB offers just a little more in our opinion. Include in the box with the Cooler Master XB are matching black screws and extras just in case you lose a few during assembly. Also included are tool-less drive rails for the SSDs. The front hot swap trays already have tool-less, flexible frames for hard drives installed. In terms of extras, black zip ties are included for tidying the wiring up. However, we'd love to see Velcro straps as a standard as they are both reusable and a little more environmentally friendly. The manual finishes off the goodies and is easy to read if you need some extra DIY help. The enclosure is made of SECC steel and painted jet black inside and out. The handles, removable trays, and bezel all match well in terms of fit and finish. The front bezel (face plate) looks similar to the HAF series in design with its mesh finish. The two 5.25" drive bay plates have two tabs that allow them to clip on and off easily, which is very similar to the ones on many of their CM Storm cases. This means there is no metal to bend or cut out to gain access to those bays. The two 3.5" hot swap bays have a single lock tab and swivel arm that pulls the drive out and naturally locks the drive in place. They're flexible and tool-less. All you have to do is slide the drive in place, press the bolts thru the sides and slide them back in position. These must have been inspired by the ones in their flagship Cosmos II chassis. The left and right side panels offer a large amount of ventilation. The bottom also features a fan vent for the power supply. The back of the case equally offers large ventilation machining in the chassis. Air flow should not be a problem for the Cooler Master HAF XB and we will verify that in testing. 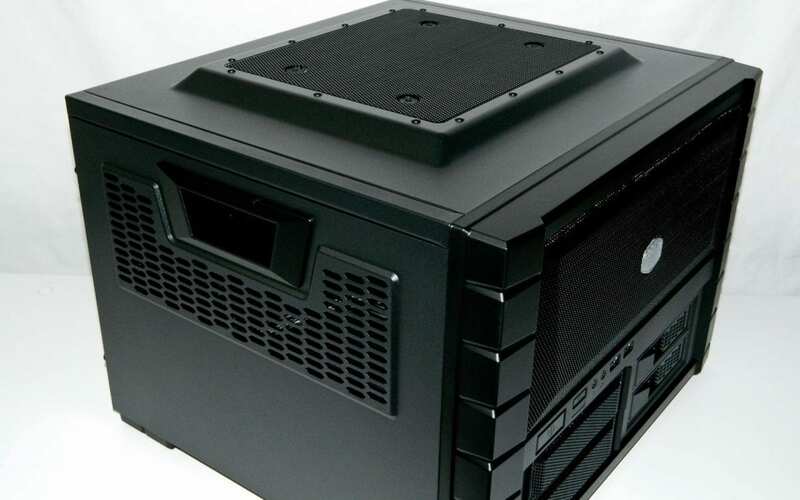 The top of the chassis is made with mesh along with rubber grommets for an optional 120mm fan. Since it's raised, it won't conflict with your large video cards or CPU coolers. It's very nicely planned out! Removing six thumb screws opens up the top and two sides. This gives you access to the removable motherboard tray, hot swap PCB underneath, 3.5"(HDD) and 2.5"(SSD) mini cages. The front panel wiring are just long enough to do a little creative routing if you want to hide wires. Naturally, the USB 3.0 ports receive their own cable since most motherboards come standard with that particular connector. The hot swap PCB board is just visible through the CPU cooler cut out.